Llegamos a nuestra 1ra meta! Gracias a la colaboración de la comunidad logramos recolectar alimentos y medicinas para animales. Una primera parte de aprox. 3,600 lbs, fue enviada a Venezuela el 24/Sep en tres contenedores de 64 pies cuadrados c/u., por un monto de $1,692.72 (ver factura en los updates). Sin embargo, necesitamos su apoyo para cubrir los costos del 2do envio de 4,800 lbs y continuar ayudando a las mascotas que están siendo abandonadas en las calles de Venezuela. Nuestra nueva meta son $2,714 (ver factura + gastos/comision de GoFundMe). Usted puede hacer una donación a este fondo o pagar directamente a la empresa de carga, EuroSur, que gentilmente ha cedido sus ganancias, cobrandonos solo el costo, para poder avanzar con esta nueva misión. Dependemos de la generosidad de todos ustedes para seguir ayudando a las mascotas víctimas de una situacion sin precedentes. Programa de Ayuda Humanitaria para Venezuela, Inc.
We achieved our 1st goal! Thanks to the comunity's help, we were able to collect animal food & medicines. A first shipment of three 64-sq ft containers with 3,600 lbs was sent on 9/24. We paid $1,692.72 (see invoice on the updates section). But, we still need your help to cover expenses for the 2nd shipment of 4,800 lbs and continue our support to pets that are being abandoned in the streets of Venezuela. Our new goal is $2,714 (see invoice + GoFundMe fee). the shipping company that has been kind enough to waive their profit and charge us only the cost so we can continue with this new mission. We count on your generosity to keep helping the pets that are victims of this terrible situation. Posted by Programa de Ayuda Humanitaria Para Venezuela, Inc. Thank you for your generosity! 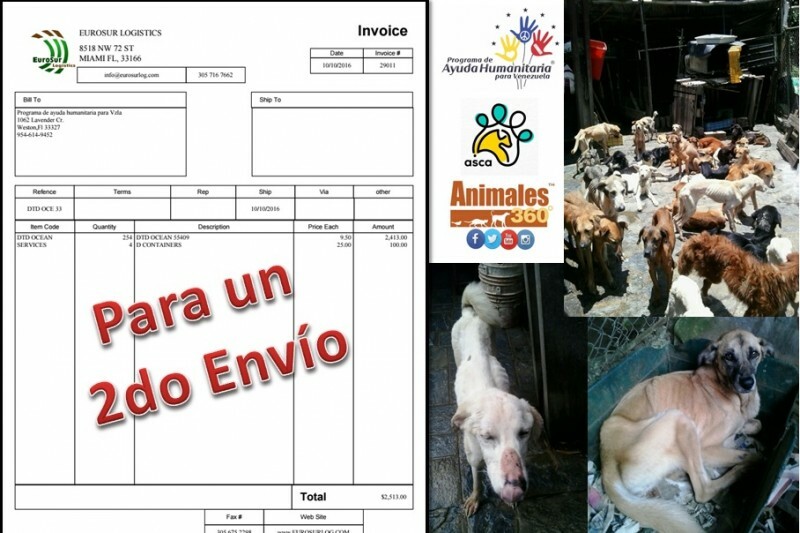 Pets in Venezuela will appreciate your help and kind heart! We were able to collect enough money to pay for the 1st shipment to Venezuela. We will continue to collect money that will be used to pay for additional shipments. Gracias por su generosidad! Todas las mascotas venezolanas agradecen su ayuda y buen corazon! Se logro conseguir el dinero necesario para pagar un 1er envio a Venezuela. Seguimos con la campana de recaudacion de dinero para pagar los gastos de los siguientes envios. PROGRAM FOR HUMANITARIAN AID VENEZUELA, Inc. opens a parenthesis to help pets being abandoned in the streets of Venezuela. Thanks to the collaboration of the community we collect nearly 600lbs of food and medicine for animals and send them to Venezuela on September 24! They were sent three containers of 64 square feet c / u., however, we need your help to cover the shipping costs and continue this work. The amount was $ 1692.72 (see invoice in updates). You can make a donation to this fund or pay directly to the cargo company, eurosur, who kindly provided their profits, charging us only the cost, to move forward with this new mission. We depend on the generosity of all of you to continue to help victims of a situation unprecedented pets. Thank you! Humanitarian Assistance Program for Venezuela, Inc.
dios les bendiga por la iniciativa de ayudar a nuestros peludos en venezuela. yo tengo un refugio ahora con 88 perros de la calle en puerto la cruz. estoy necesitando ayuda con comida. puedo demostrar que es verdad... que necesito para poder ser candidata a su ayuda? The Humanitaria Relief Program for Venezuela, Inc. opens a parenthesis on its regular activities of collecting medical supplies for the people of Venezuela, to help pets being abandoned in the streets of Venezuela. Thanks to the collaboration of the community we collected nearly 600lbs of food and medicine for animals and sent them to Venezuela on September 24! Three containers of 64 square feet c / u. were sent, however, we need your help to cover the shipping costs and continue this work. The amount was $ 1692.72 (see invoice in the update section). You can make a donation to this fund or pay directly to the cargo company, eurosur, who kindly waived their profits, charging us only the cost, allowing us to move forward with this new mission. We depend on the generosity of all of you to continue to help pets who are also victims of a unprecedented situation. Thank you! Humanitarian Releif Program for Venezuela, Inc.
Hola, podrían incluir la traducción al Inglés? Estoy compartiendo con gente que no habla Español. Para que puedan leer y donen con conocimiento de la causa. Muchas gracias!!! Muchas gracias por la labor que están haciendo! Thank you for taking care of pets. You are giving them a voice.